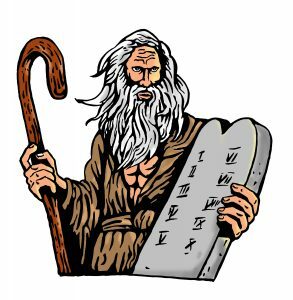 And GOD said unto Moses, “These are my commandments to party.” Moses replied, “You mean rules?” “Not exactly”, God rumbled, and so began the initiative to form a more perfect Disc Jockey and all who followed this divine list of instructions became apostles, even to become known as professional mobile disc jockeys. There is a difference between home audio equipment and professional disc jockey’s. We promise that our equipment will not cause electrical fires, cracking sounds or high-pitched tones. However, we cannot offer any disclaimers for the guests. We take our business seriously and carry all required city licenses and carry liability insurance. All conditions and terms of our booking should be set into an agreement. With a written contract, everything is spelled out, including choice of music, duration of event, and compensation. Everything is spelled out in black and white,. Any eclectic music enthusiast may have a large selection of music BUT a professional will have an entire library. This enables us to provide music for any occasion. We can locate even the most obscure tunes at a moment’s notice and will ALWAYS field all announcements. A professional entertainer can locate even the most obscure tunes at a moment’s notice. Then, they offer key announcements at the correct times. Or, they can rearrange the announcements for practical jokes. They can also tap dance, juggle fire and swallow swords during announcements – if that is your desire. Just as equipment makes a big difference, so does attire. A professional should have appropriate and proper apparel at no extra cost. Professionals always arrive at least 1 to 1.5 hours ahead of schedule-not only to move the equipment and set up for the event but, to field last minute changes in the event. Sometimes we’ll even get to an event earlier. In the rare event that your entertainment is not able to perform at your function, we will have a substitute of equal professionalism. We have backup equipment as well.